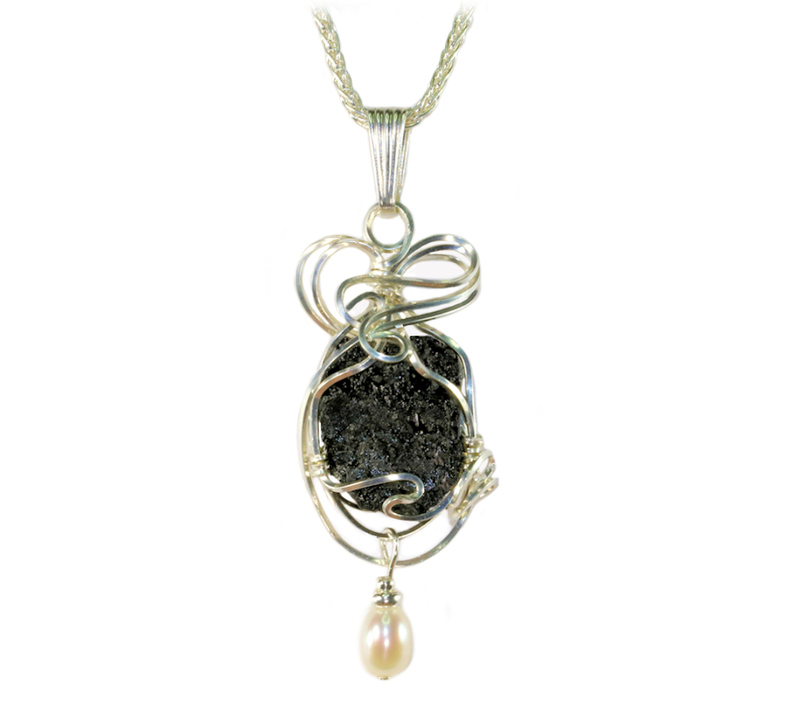 This famous RMS Titanic sunken shipwreck coal is now available as pendant necklace jewelry. 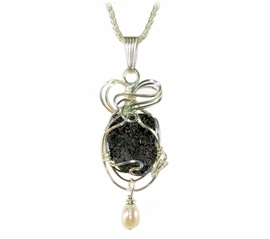 It has been professionally hand wire wrapped in Sterling Silver, in a creative flowing open cosmic design. It's great for people that cherish the historical legacy of the incredible sunken shipwreck RMS Titanic. This Titanic shipwreck coal memorabilia jewelry has a real pearl accent. Each piece is similar yet different with combinations of dark and brilliant tones. It also ships with other choices of accents such as amethyst, aquamarine or garnet. The coal is from the actual sunken shipwreck of the RMS Titanic -- that was recovered from the icy waters of the North Atlantic Ocean at a depth of about 12,000 feet. Each piece of Titanic coal has been professionally stabilized with crystal-clear, high-grade jeweler's epoxy, which strengthens it. The pendant is about 2 1/4" inches long by 5/8" wide. An 16-18" adjustable quality sterling silver chain is included, along with a description about the ill-fated voyage of the Titanic and a Certificate of Authenticity of Origin. Awe-inspiring "Jewelry with a Story!" Details about the RMS Titanic Coal: This coal was recovered from the sunken RMS Titanic. This Titanic coal was sold by RMS Titanic, Inc., and recovered during the 1994 Titanic Research and Recovery Expedition.